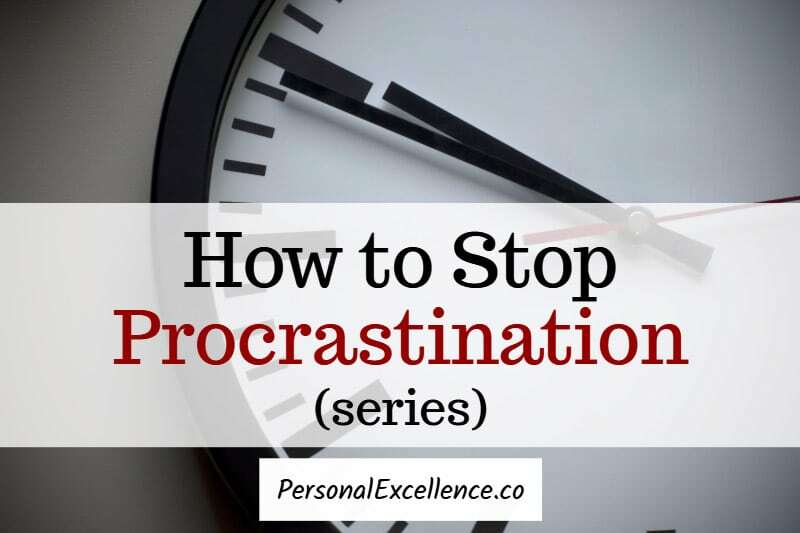 This is part 1 of my 5-part series on how to stop procrastination. Part 1: Why Stop Procrastination? Is there something you are procrastinating on in your life right now? What is it? Is it related to your work? Your relationships? Your family? Your health? What is one thing you should be working on in your life, but you are putting off for one reason or other? Some may not see procrastination as a real problem, because they feel that they benefit from procrastination. For example, when you successfully avoid something you have been procrastinating on. Or you procrastinate on something and you’re somehow able to finish it in time, hence cutting down the time spent on it. But while you may think that procrastination puts you in a better place, it doesn’t. It is just an illusion. Say it is Monday now and you have an important report to finish by Friday (a high-impact task). This report is one of the most important tasks on your to-do list, but you put it off due to the large amount of research needed. Rather than work on it, you spend the next 3 days working on less important tasks. Then, Thursday arrives and you are trapped — you have to work on the report. You find yourself in hot soup, because there are so many things to do! After all, that’s the reason you put it off initially — because there’s too much to do! To meet the deadline, you pull an all-nighter. After painfully sloughing through the night, you manage to finish it at 4am and meet the Friday deadline. So in the end, the task gets done, the report is submitted on time, and everything turns out fine. Leaving the task to the last minute creates a sense of urgency which appears to boost your productivity, giving you a higher output per unit time spent working. You experience short-term relief from not having to deal with the report on Mon-Wed.
Procrastinating didn’t jeopardize anything in the end, because you met your deadline. Your time from Mon to Wed was not effectively spent. Ideally, you want to allocate time to a task based on its importance. The more important a task, the more time you should allot to it. Spending more time on less important work doesn’t give you a big increase in value, because the work is already less important. A ratio I use is 80:20, where I spend 80% of my time on high-value tasks and 20% on low-value tasks (read Day 8 of Live a Better Life in 30 Days Program on creating your 80/20 to-do list). Unnecessary anguish (whether consciously or subconsciously) from trying to avoid the task. The more you prolong the task, the more anxiety you get, compared to if you had dealt with the task head on. This anxiety is unnecessary. Not only that, but your continuous avoidance forms a distorted image of how intimidating the task is in your mind, compared to what it really is. In the end you have an exaggerated but baseless fear of the task you’re supposed to do. More often than not, the final output is short of what you are really capable of, as leaving it to the last minute leaves you with insufficient time to create your best output. These 3 downsides are counterpoints to the 3 illusionary benefits. When you compare them, the cons far outweigh the supposed benefits of procrastination. Not only are you less productive, but you experience unnecessary anxiety and deliver an output that’s short of what you can do. Procrastination puts you in a worse position vs. if you don’t procrastinate. As I’ve written before in What Are You Running Away From? (Dealing with Escapism), avoidance does not bring you closer to what you want. Procrastination is a form of avoidance. Thus, if you sometimes procrastinate on your goals and tasks, it’s time to resolve this and stop wasting your life away. As long as you keep putting off what you should be doing, you are putting off living. This is no better than being a sleepwalker.